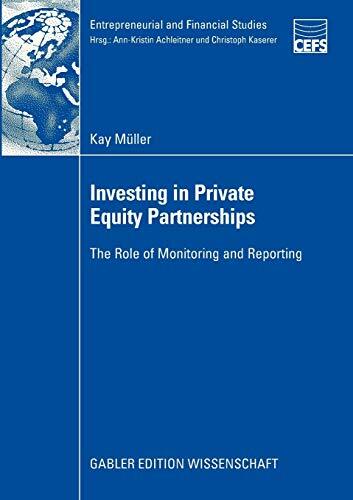 [PDF] Investing in Private Equity Partnerships: The Role of Monitoring and Reporting (Entrepreneurial and Financial Studies) | Free eBooks Download - EBOOKEE! Description: Private equity has become an important asset class for institutional investors. As the asset class grows and investors get more experienced, the debate concerning transparency and governance of private equity funds has intensified. Fund investors demand more disclosure from private equity fund managers. Are these calls justified? What information do fund investors need? How can private equity fund investors manage their exposure to the asset class effectively? Kay Mller presents a in-depth analysis into the monitoring activities of insitutional investors and explores their information requirements by interviewing leading European private equity fund investors. No comments for "[PDF] Investing in Private Equity Partnerships: The Role of Monitoring and Reporting (Entrepreneurial and Financial Studies)".